6 3/4 x 5 1/4 x 3/8 in. My box set of bookworks, Masters in Art, is comprised of six books from a series by Hyperion Press whose respective reproductions of Botticelli, Cezanne, Degas, El Greco, Goya, and Van Gogh have been either fully or partially rubbed out by power sanders. In these particular interventions, I have focused on using my thin quarter-inch belt sander as a fine drawing instrument, paying close attention to the effects not just on the recto image but on the verso image of the same page. In this way, I have discovered the fine, thin sharp edges that I sought to create on the recto side by drilling from the back of the page have produced elegant, sensual white curving forms on the finely frayed verso side. 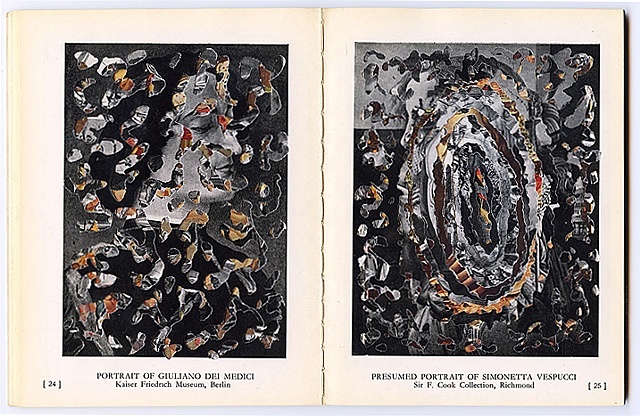 The viewer, peering through the cavities of these scraped images on either side, is able to read many pages simultaneously and experience collage readingthe act of grasping a greater whole through its parts at a single glance.